Queen Mab inherits the debt Harry Dresden previously owed to the Winter Fae. Harry twice views Queen Titania with his Wizard’s Sight. 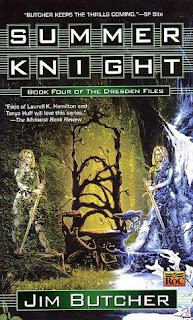 Queen Mab and Queen Titania are from William Shakespeare’s plays Romeo and Juliet and A Midsummer Night’s Dream, respectively, and become recurring characters in the Dresden Files series with this novel. Titania also appeared in Gargoyles (which had quite a few Shakespeare references) were she was voiced by that actress that did Captain Janeway. I know you plan to include the episode with Tana leaves in Crossovers. I don't know if you plan to include any other episodes. 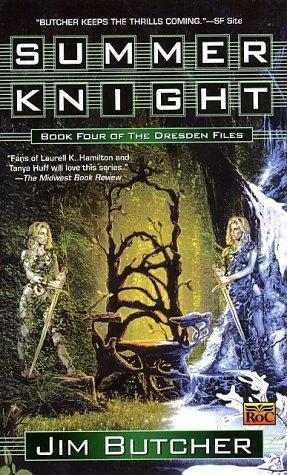 I believe Mab and Titania also appeared in the Nightside series. Another interesting shout-out in this one is that the murdered Summer Knight's name, Ronald Reuel, is what the Rs in J.R.R.Tolkien's name stands for. Now, Jim Butcher has stated that they are, quote, "Not the same guy", but I like to think that this Summer Knight is in fact Professor Tolkien, having traded a period of service to the Summer Court in exchange for help translating and/or access to copies of the Red Book of Westmarch, anyway. After all, working for the Fair Folk can change a man quite a bit . . .